Elena Delle Donne was killing it for the Washington Mystics tonight, following up a destructive Game 1 by putting up 27 points, 14 boards, and six assists in Game 2 of her team’s series against the Atlanta Dream. 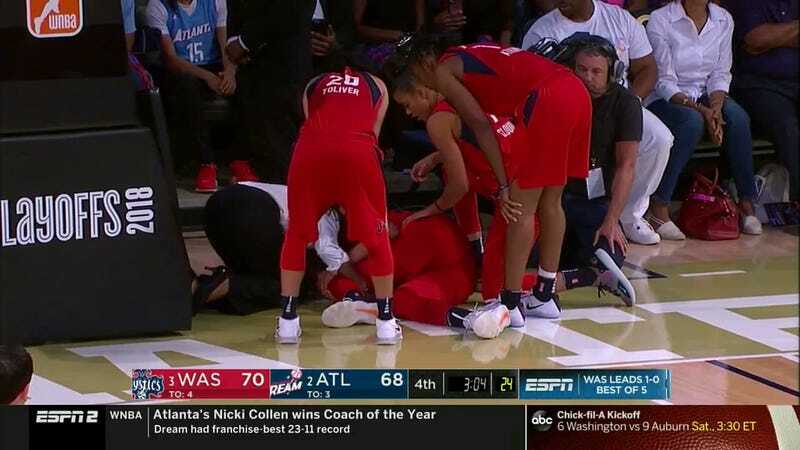 Unfortunately, with 3:04 remaining and the Mystics leading by two, Delle Donne injured her left knee with a really awkward bend on a drive to the basket and left the game for good. Without the Mystics’ best player on the floor, the Dream took advantage, and eked out a 78-75 win to even the semifinals.